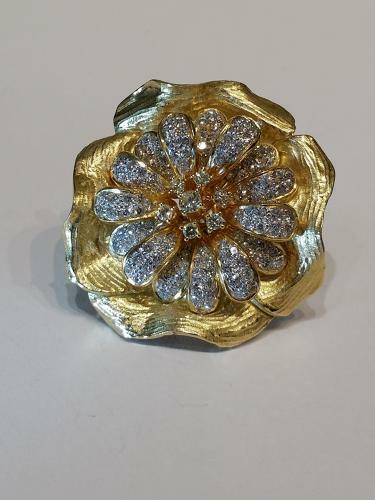 This large impressive piece is set in the centre with yellow diamonds with the surrounding petals set with small brilliant cut diamonds the total weight of which is approximately 3.80 carats. The piece weighs 30.8 grams. Born in New York, Norman LeBeau studied art and had an early career as a painter, he decided that as few artists made a living from their work he would retrain as a jeweller, a trade which would still make use of his artistic talent. After gaining a few private commissions he was able to open his first shop in New York 1954, moving to Madison Avenue in 1964. He also opened stores in Palm Beach and Chevy Chase under the Boris-LeBeau name. His designs won him many awards including the De Beers Diamond Award. Always an artist at heart his pieces are very sculptural in design. Norman LeBeau retires in 1994 and took up sculpture in his retirement.